A Vaseline face whitening application has been made available on Facebook in India. What? Yes, you read correctly, the myth of an ideal race is still being perpetuated in this day and age! Basically the skincare group has developed the Facebook application to allow Indian men and women to digitally lighten their skin color on their profile pictures. I hope it’s not just me who finds this news repulsive. Why would Vaseline do such a heinous thing? Money. It’s all a clever ploy to promote their new range of skin lightening creams for men. It looks like skin lightening is a growing market in India. Worse still is the fact that the Facebook skin lightening widget has received a fantastic response. Oh man, why do people have to buy into crap like this? Didn’t we learn anything from Michael Jackson? When I first read about the app, I thought, why is skin lightening a booming industry in India and not some other part of the world? Well, apparently it’s because Indians believe that you belong to a higher caste (the Brahmins) if you have lighter skin. I feel so upset when I read stuff like this, because it just seems so primitive. But then I guess the Western standards of beauty which are upheld by the media and entertainment industry aren’t much better – they’re just more subtle. 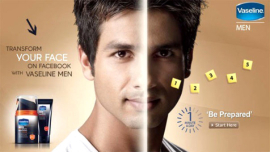 The racist Facebook application by Vaseline is being promoted by the Bollywood star Shahid Kapur. His face, divided into a light and dark side, is the face of the app. He should be ashamed. Not only do these lightening products uphold some seriously misguided beliefs about race, but many of them are harmful. Do I have to mention Michael Jackson again? The guy practically had to keep every part of his body covered because he had bleached, cut and sewn it all back together. That’s my rant for today. I just couldn’t believe the headline when I read it. If you think we’re living according to higher standards in the 21st century, think again. We’re more plastic now than ever before. And with social media tools like Facebook and Twitter around, these misguided ideals are being spread faster than the speed of light. This entry was posted in Uncategorized and tagged entertainment, Facebook, India, Indian, racist Facebook application, Twitter. Bookmark the permalink. Awesome page, I hadn’t noticed candidcactus.wordpress.com before in my searches! Keep up the good work!